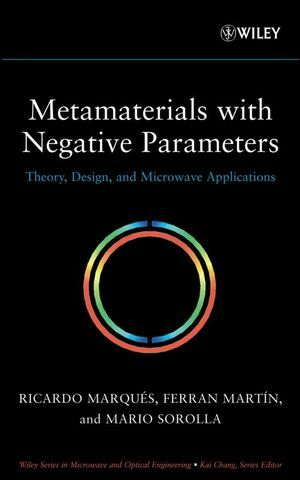 Metamaterials with Negative Parameters represents the only unified treatment of metamaterials available in one convenient book. Devoted mainly to metamaterials that can be characterized by a negative effective permittivity and/or permeability, the book includes a wide overview of the most important topics, scientific fundamentals, and technical applications of metamaterials. 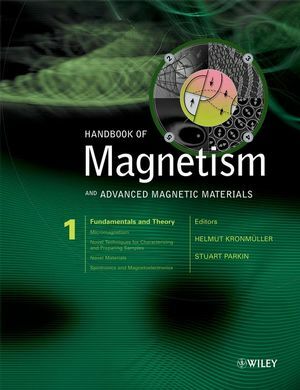 Chapter coverage includes: the electrodynamics of left-handed media, synthesis of bulk metamaterials, synthesis of metamaterials in planar technology, microwave applications of metamaterial concepts, and advanced and related topics, including SRR- and CSRR-based admittance surfaces, magneto- and electro-inductive waves, and sub-diffraction imaging devices. 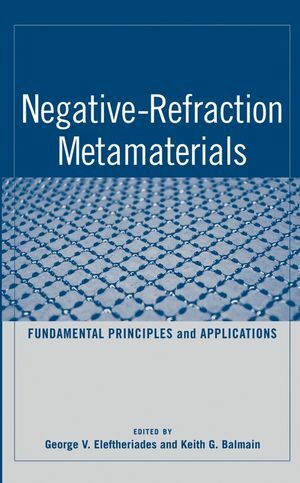 A list of problems and references is included at the end of each chapter, and a bibliography offers a complete, up-to-daterepresentation of the current state of the art in metamaterials. Geared toward students and professionals alike, Metamaterials with Negative Parameters is an ideal textbook for postgraduate courses and also serves as a valuable introductory reference for scientists and RF/microwave engineers. Ricardo Marqués is a Professor in the Departamento de Electrónica y Electromagnetismo at the Universidad de Sevilla in Spain. Ferran Martín is a Professor in the Departament d'Enginyeria Electr?nica at the Universitat Autnoma de Barcelona in Spain. Mario Sorolla is a Professor in the Departamento de Ingeniería Eléctrica yElectrónica at the Universidad Pública de Navarra in Spain. Professors Marqués, Martín, and Sorolla have coauthored more than fifty research works in the field of metamaterials, published in relevant journals and conference proceedings, and have been responsible for various domestic and international projects. They hold several patents related to metamaterial applications. 1. The electrodynamics of left-handed media. 1.1. Wave propagation in left-handed media. 1.2. Energy density and group velocity. 1.5. Other effects in left-handed media. 1.6.1. Transmission and reflection coefficients. 1.7. Waves through left-handed slabs..
1.7.1. Transmission and reflection coefficients. 1.7.3. Backward leaky and complex waves. 1.8. Slabs with ε/εo-1 and µ/µo-1. 1.8.1. Phase compensation and amplification of evanescent modes. 1.8.4. The perfect-lens as a tunneling/matching device. 2. Synthesis of bulk metamaterials. 2.1. Scaling plasmas at microwave frequencies. 2.1.1. Metallic waveguides and plates as one- and two-dimensional plasmas. 2.1.3. Spatial dispersion in wire media. 2.2. Synthesis of negative magnetic permeability. 2.2.1. Analysis of the edge-coupled SRR. 2.2.3. Constitutive relationships for bulk SRR metamaterials. 2.2.4. Higher order resonances in SRRs. 2.2.6. Scaling down SRRs to infrared and optical frequencies. 2.3.1. One-dimensional SRR-based left-handed metamaterials. 2.3.2. Two-dimensional and three-dimensional SRR-based lefthanded metamaterials. 2.3.3. On the application of the continuous medium approach to discrete SRR-based left-handed metamaterials. 2.3.5. On the numerical accuracy of the developed model for SRR-based metamaterials. 2.4. Other approaches to bulk metamaterial design. 3. Synthesis of metamaterials in planar technology. 3.1. The dual (backward) transmission line concept. 3.2. Practical implementation of backward transmission lines. 3.3. Two-dimensional (2D) planar metamaterials. 3.4. Design of left handed transmission lines by means of SRRs: the resonant type approach. 3.4.1. Effective negative permeability transmission lines. 3.4.2. Left handed transmission lines in microstrip and CPW technologies. 3.5. Equivalent circuit models for SRRs coupled to conventional transmission lines. 3.5.2. Implications of the model. 3.6. Duality and complementary split rings resonators (CSRRs). 3.6.1. Electromagnetic properties of CSRRs. 3.6.2. Numerical calculation and experimental validation. 3.7. Synthesis of metamaterial transmission lines by using CSRRs. 3.7.1. Negative permittivity and left handed transmission lines. 3.7.2. Equivalent circuit models for CSRR loaded transmission lines. 3.7.4. Effects of cell geometry on frequency response. 3.8. Comparison between the circuit models of resonant type and dual left handed lines. 4. Microwave applications of metamaterial concepts. 4.1.2. Planar filters with improved stop band. 4.1.3. Narrow band pass filter and diplexer design. 4.1.3.1. Band pass filters based on alternate right/left handed (ARLH) sections implemented by means of SRRs. 4.1.3.2. Band pass filters and diplexers based on alternate right/left handed (ARLH) sections implemented by means of CSRRs. 4.1.4. CSRR-based band pass filters with controllable characteristics. 4.1.4.1. Band pass filters based on the hybrid approach: design methodology and illustrative examples. 4.1.4.2. Other CSRR-based filters implemented by means of right handed sections. 4.1.5. High pass filters and ultra wide band pass filters (UWBPFs) implemented by means of resonant type balanced CRLH metamaterial transmission lines. 4.1.6. Tunable filters based on varactor-loaded split rings resonators (VLSRRs). 4.1.6.1. Topology of the VLSRR and equivalent circuit model. 4.1.6.2. Validation of the model. 4.1.6.3. Some illustrative results: tunable notch filters and stop band filters. 4.2. Synthesis of metamaterial transmission lines with controllable characteristics and applications. 4.2.1. Miniaturization of microwave components. 5. Advanced and related topics. 5.1. SRR and CSRR based admittance surfaces. 5.1.1. Babinet principle for a single split rings resonator. 5.1.2. Surface admittance approach for SRR planar arrays. 5.1.3. Babinet principle for CSRR planar arrays. 5.1.4. Behavior at normal incidence. 5.1.5. Behavior at general incidence. 5.2. Magneto- and electro-inductive waves. 5.2.1. The magneto-inductive wave equation. 5.2.3. Electro-inductive waves in CSRR arrays. 5.2.4. Applications of magneto- and electro-inductive waves. 5.3.1. Some universal features of sub-diffraction imaging devices. 5.3.2. Imaging in the quasi-electrostatic limit. Role of surface plasmons. 5.3.3. Imaging in the quasi-magnetostatic limit. Role of magnetostatic surface waves. 5.3.4. Imaging by resonant impedance surfaces. Magneto-inductive lenses.